In May of 2014, Rev. William P. Worley was elected and currently serves as Conference Minister and President of the Pennsylvania Southeast Conference of the United Church of Christ. Rev. Worley is a graduate of Gettysburg College, and Lancaster Theological Seminary (MDiv/DMin). 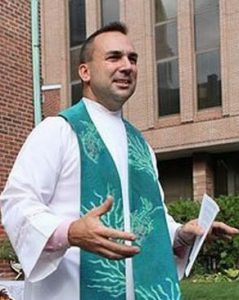 He was ordained in 1994 while engaged in ministry as Associate Pastor of Union Congregational Church in Montclair, New Jersey. He specialized in urban ministry, congregational vitality and transformational ministry. He has served as President of the Lancaster Downtown Ministerium, and Clergy Representative on the Mayor’s Gang Prevention Task Force, The Green City Initiative and the 9/11 Remembrance Commission. He Co-Chaired the Lancaster Temporary Winter Shelter Planning Committee, the CROP Walk Planning Task Force and, for several years, was a camp director at Hartman Center Outdoor Ministries. He has been active in several UCC ministries including the Lancaster Association Church and Ministry Committee. Pastor Worley served as a commissioned officer in the United States Navy Reserve assigned to the Marine Corps where, as Chaplain of Marines, he was twice decorated. He is a veteran of the Iraq War and helped found “Homebase,” a Lancaster area Iraq/Afghan Veterans Group. In his thirteen years as Senior Pastor at First Reformed Church, Lancaster PA, Pastor Worley was engaged in the re-vitalization of an urban ministry campus though community outreach development, lay leadership training, new member recruitment, and capital improvement projects. His hobbies include weightlifting, kayaking, theater/concert going, camping, skiing, gardening, and hunting. He is the proud father of two sons, Zach and Justin.